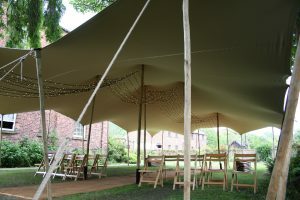 We had fun putting this stretch tent up for a wedding ceremony at Thwaite Mills in Leeds, West Yorkshire. 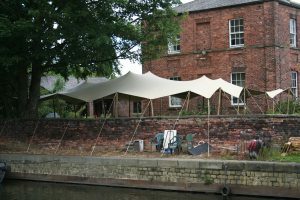 The bride and groom wanted a stretch tent for 100 people in the grounds of these beautiful listed buildings. We’d visited the site before for one of our pre-site checks and had to assess the underground electrics to make sure our meter long stakes didn’t interfere with anything! After measuring up we found that the spot was a perfect fit for one of our smaller stretch tents. Here is a link to the completed set up. The happy couple naturally wanted the aisle to be the focus of the tent and we achieved this by using extra king size poles. We decorated the stretch tent with a special fairy light curtain set up to create a magical setting and we also provided the flooring. 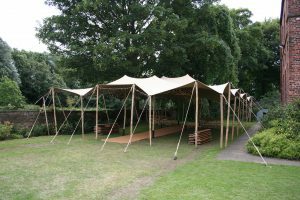 We don’t just provide stretch tents, we can also provide anything and everything you might need to go with it. 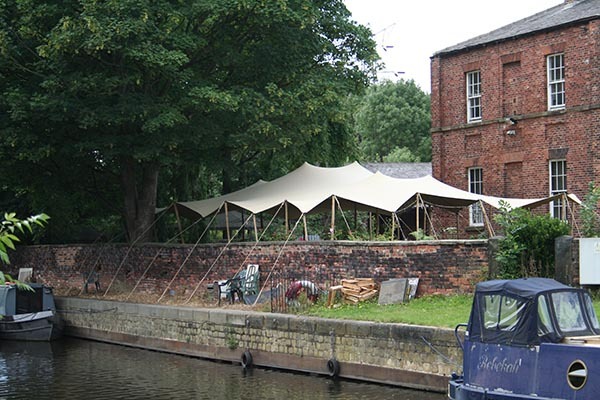 Thwaite Mills is the ideal location for a wedding as it’s not far from Leeds city centre, and nestled on a small island in between the Leeds and Liverpool Canal and the River Aire. It has a number of spaces licenced for wedding ceremonies. 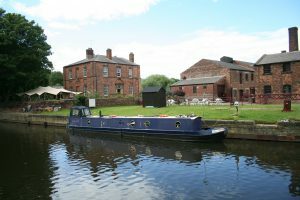 If you’ve never been it’s a fully restored working water-powered mill built in 1823-25, harnessing the power of the River Aire. Nowadays it’s an industrial museum open to the public and is owned by Leeds City Council and well worth a visit. As well as functioning waterwheels, the mill contains a collection of machinery used at various times and visitors can have a guided tour. The manager’s house has been restored to reflect life at the mill in the 40s, before electricity was installed, and is visited self-guided. The museum site includes a steam crane from 1946, and wildlife areas. A variety of special events are held at the museum and there is a picnic area, a shop, tea and coffee facilities. Click here for a quote for a stretch tent for your wedding ceremony.